First Leg –Vietnam (April 2-5). 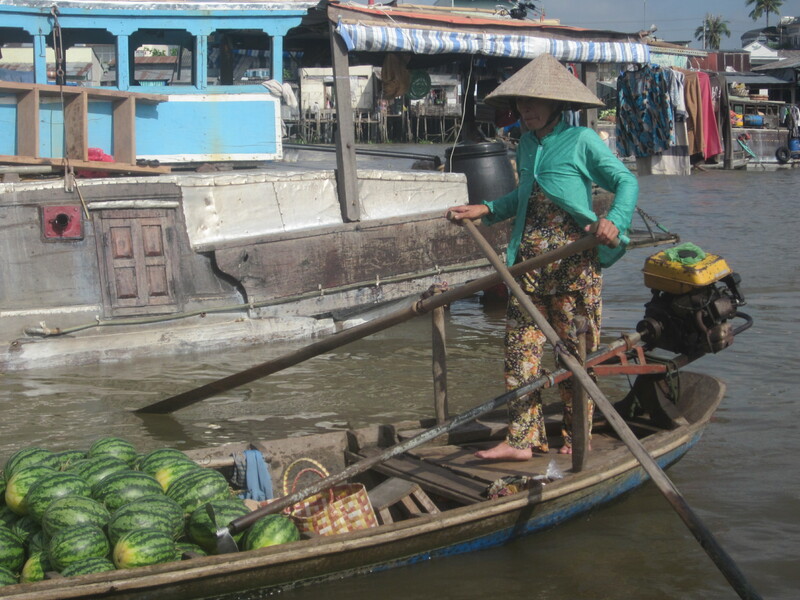 Sightsee Saigon for a day, then take a three-day tour of Mekong Delta. Take boat into Cambodia. Second Leg — Cambodia (April 6-11). 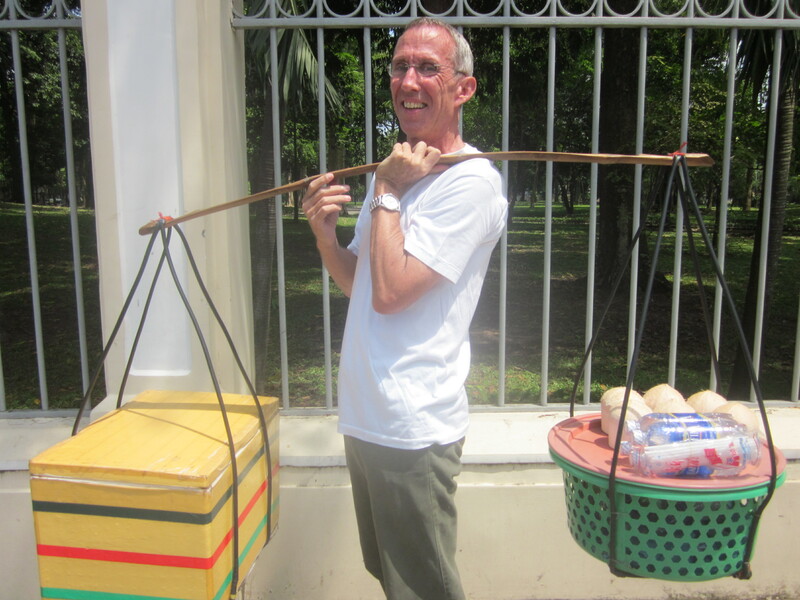 Tour capital Phnom Penh for two days, then bus north to Battambang for a day. Get back on the Mekong to Siem Reap. Explore Angkor Wat for three days. Third Leg — Laos (April 12 -15). Fly to Luang Prabang and spend two days. Bus south to Vang Vieng for one day. Bus to capital Vientiane for one day. Final Leg — Thailand (April 16 – 20). Overnight bus to Bangkok. Spend four days touring capital. Our flight out of Manila departs just after midnight, and we get into Saigon in the wee hours. On the way in, we’re fascinated by thousands of brilliantly illuminated shapes below us that look like enormous jigsaw puzzle pieces. No shape is the same. They stretch as far as the eye can see. “What the hell are they?” I ask B.J. We can’t tell if the objects are on land or on water. It’s pitch dark outside, yet the things appear to be illuminated from above, and they’re uniformly lit — the farthest ones just as bright as the nearest ones. When we land, we ask a flight attendant if we can ask the pilot what the objects were. They open the cockpit door, and the pilot tells us he was curious about them, too. They were on the water, though. “They might be fish traps,” he guesses. “Bright lights attract fish and crabs. The traps probably have their own light source.” Mystery solved. At the airport, all the foreign passengers are herded into a special area to get our visas, which is a slow and laborious process. This must be done before we can get our luggage. As we wait, we see passengers from other flights arriving and getting their luggage, and other flights following them. Who’s watching our luggage? The other passengers on our flight are getting nervous, too. After an hour and a half, we’re all visibly concerned. By now, all the flights for the night have landed and the airport is quiet and deserted. I mentally review what I packed in my checked bag. Chances are slim that our bags will still be out there. If I lose everything, what will I need to buy to replace what’s lost? Finally, our visas are issued, and we all race to the baggage counter area. Not a bag in sight. Not a person around. We finally find someone and ask where our bags could be. She asks the name of our airline. Cebu Pacific. She points all the way down to the end of the immense hall. We hurry toward the dark cavernous corner of the building. There, sitting all alone, like two lost cowering puppies, are our bags. How they weren’t snatched during all that time, with no security around, is a small miracle. We wake up an old woman sleeping in the lobby of Madam Cuc’s guesthouse, and she staggers around half asleep trying to find our key and paperwork, which the day staff had thankfully prepared ahead of time. We get to our room, which is enormous and decorated in rich red woods, and instantly fall asleep. The lobby the next morning is throbbing with backpackers and German tourists. We’re served breakfast (free with the room) and plan our day. Neither of us want to see anything related to the war (War Museum, Cu Chi Tunnels) that have unfortunately become tourist attractions. Instead, I want to show B.J. some of the landmarks during the war that I remember fondly from that period (the Rex Hotel, where journalists David Halberstam and others listened to the daily misinformation briefings by U.S. generals on how “easily” we were winning the war, which the reporters soon dubbed “the Five o’clock Follies”; the Caravelle Hotel, where the scribes drank and hung out; the Hotel Continental, where the generals stayed and which I used as a backdrop for a scene in one of my novels; and the opulent Opera House and Post Office downtown that are marvels of French Colonial architecture and among the last vestiges of the French debacle that preceded ours. But we get lost. We end up spending half the day taking wrong turns and following errant directions before we finally get to where we want to go. And when we do, I’m disappointed. Sinh Cafe, where I used to hang out with expats on previous visits, is gone; it’s now a travel agency. Kim Cafe, however, remains, still serving banana pancakes and Spanish omelettes. When a uniformed bellman at the Hotel Continental opens its brass and glass doors to us, I’m stunned when I step into what was once one of the most magnificent lobbies in the world. It’s now the size of a living room. On one corner wing of the hotel, which was once a tea area surrounded by grand sculptures and artwork, is now an upscale restaurant. On the other wing of the lobby where once were sofas and chairs and waitresses draped in black and gold ao dais tinkling bells announcing messages for guests, is now a series of high-end shops. I’m seriously bummed. Whoever owns the place now believes that money trumps tradition. Saigon has definitely changed since the last time I was here. Some good, some bad. No more begging children. Where have those cute little pests gone? No more bicycles on the streets either. Everyone rides a motorcycle now. People are well-dressed, clean, neat. But in shop after shop, they’re uniformly surly, impatient, and irritated whenever we approach them. Smiles from passersby, once common, are rare. What happened to this once charming, friendly city? When we wander into a mall to windowshop for cheap trinkets, all we see are Gucci, Dior, Prada, Armani. We pass a high school getting out, and a flood of girls in cotton-white ao dais, the most alluring female garment in the world — glide past us, their long tunics and long hair flapping in the breeze like an oil painting. Thank goodness that hasn’t changed. I mention that one of Saigon’s former leaders, Nguyen Cao Ky, now lives in California. Not the wisest thing to have said. His smile vanishes. He starts talking about the war, and as he does, his mood mutates. “It was horrible,” he says of the war, staring hard at me through the rear-view mirror. “Many people die. Many family destroy. Do you visit Cu Chi Tunnels?” he asks us. Cu Chi is an area near Saigon where the Viet Cong built an intricate series of underground tunnels during the war. The tunnels hid them from the South Vietnamese and U.S. troops. From the tunnels, they were able to strike our positions and then disappear. The tunnels were self-supporting and included living quarters, kitchens, even hospitals. They were also booby-trapped in case anyone tried to flush them out. That onerous duty fell to the “tunnel rats,” soldiers small enough to fit into the narrow compartments. The cab is silent. I don’t know what to do. I don’t know what to say. In all my travels to Vietnam, this is the first time anyone has brought up the war, the first time anyone has done so in a negative way, and the first time anyone from the other side has done so. I always feared this kind of exchange might happen one day, most likely in Hanoi, but it never did. After many return visits without a hint of anger or resentment from anyone, I had put that possibility out of my mind because it was clear that the Vietnamese people had done so. So I’m surprised to have been confronted so forcefully and emotionally. And in Saigon. And from a driver who deals with Americans on a daily basis. I can tell B.J. is as uncomfortable as I am. I’m relieved when the driver finally pulls up in front of our guesthouse. We pay him and get out. I consider saying something, but “I’m sorry” doesn’t seem appropriate enough. I make a mental note not to mention Nguyen Cao Ky again. 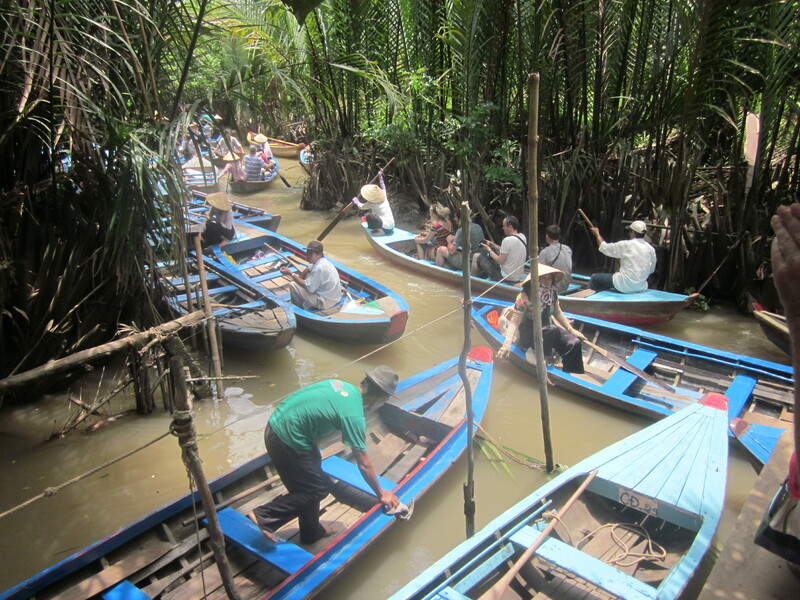 The next day we sign up for a three-day tour down the Mekong Delta, a glorious rice bowl of floating markets, river traffic, lush vegetation, and drop-dead scenery. The region encompasses 15,000 square miles of southwestern Vietnam and produces about half of the country’s rice output. Vietnam is currently the largest exporter of rice globally, growing more rice than Korea and Japan combined. Our group is a good one: a delightful retired English couple with whom everyone falls in love; Lola, a flirty young Italian woman who keeps us laughing; Dominick, a quiet young German whom we assume will hook up with Lola but never does; and an American businessman who was a Peace Corps volunteer in Guatemala and the Dominican Republic in the 1990s. We swap stories about the Peace Corps. He’s shocked that we’re all issued cellphones these days. He shakes his head at the size of our batch (149); his was a dozen. The Mekong, which the Vietnamese call the River of Nine Dragons because of its nine “tails” or tributaries that flow through the Delta, is the world’s 12th longest river. Running through seven countries — Tibet, Myanmar, China, Laos, Thailand, Cambodia, and Vietnam — it’s as wide as a Nebraska plain and as brown as a mocha frappe. We get onto a long boat and head down the swiftly moving current. We stop off at Unicorn Island in the middle of the river and transfer to canoes where we paddle through lush nipa marshes. We stop for lunch during which Vietnamese singers and musicians serenade us and teach us how to pluck their odd, single-string instruments. We reach Can Tho, the epicenter of the Delta, by late afternoon. Everyone marvels at the city’s charming design. It’s clean and big, the highlight being a remarkable riverfront boulevard that begs to be strolled. We do so, stopping along the way at dozens of boutique shops to haggle for handmade souvenirs. At dinner, B.J. and I learn from our travel mates that we avoided a typhoon that ravaged southern Vietnam a couple of days before we arrived. Most of our companions were unable to leave their hotel rooms during the onslaught. The next morning we head out early to witness the cacophony of Cai Rang, the largest floating market in Vietnam, where boats and barges and canoes and longtail boats weave among themselves selling their wares. Spiked atop a pole on the bow of each watercraft is the item it’s selling. If you want watermelons, look for a watermelon on top of someone’s pole. The market is a zoo in more ways than one, with as many tourist boats vying for space in the channel as merchant boats. I cringe as boat after boat of tourists surround the vendors and buyers, gawking at them and snapping their pictures as if they’re cute animals on a safari. I try to imagine how I would feel if crowds of tourists surrounded my desk every day at work and snapped pictures at everything I did. We get on a bus and head north to Chau Duc on the border of Vietnam and Cambodia and check in to a floating hotel on the river for the night. The town is dead, there’s nothing to see, and the people unfriendly. 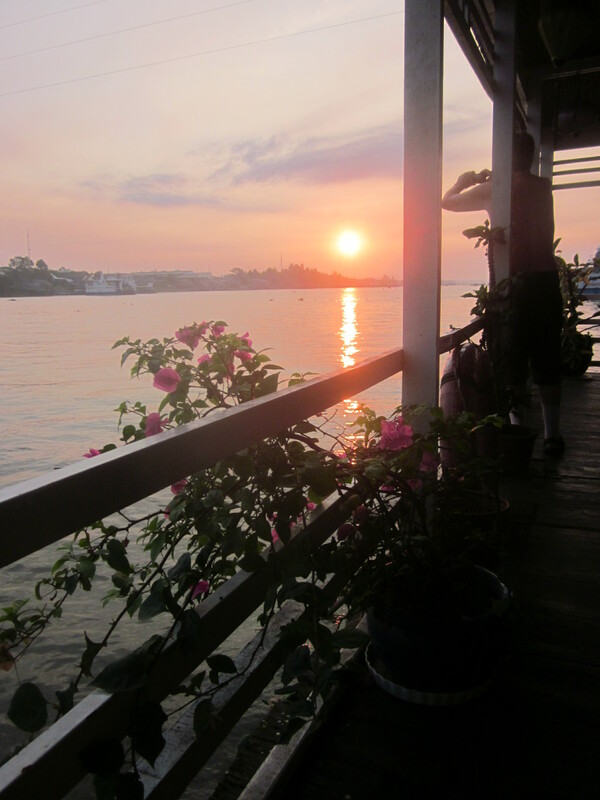 The next morning we get back on the river for a slow, boring six-hour slog to Phnom Penh, the capital of Cambodia. We’d heard this river route was the most languid and romantic way to enter the capital. Whoever wrote that should be shot. There’s nothing to see, virtually no river traffic, and the banks of the river seem a mile away. Next stop: Cambodia and the grandeur of Angkor Wat.